Submitted by Jeff Buster on Mon, 10/12/2009 - 22:49. I went by the Richmond building to see what was happening after Oengus reported about a potential sale of the building to perhaps the All Crane parties. Behind the Richmond Building is a neighborhood of single family buildings with a few industrials thrown in. 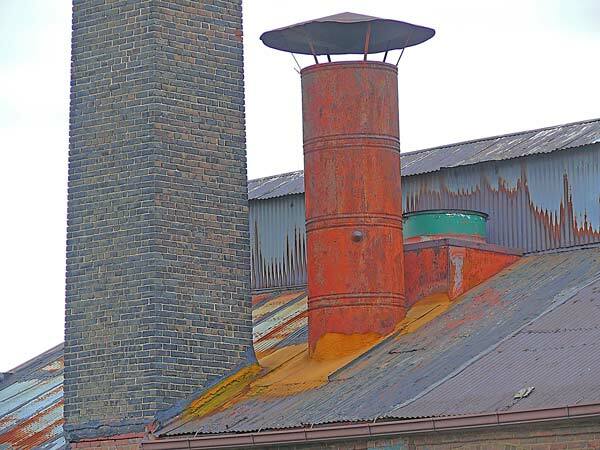 There was some good graffiti, and these chimneys, colored by temperature. Just goes to show, it isn't only the flowers who express themselves. Submitted by westward on Mon, 10/12/2009 - 23:26. I noticed a lack of what we in NEO call graffiti in the photos from Baltimore, just the art on the boards. Was that true or was it because it just wasn't in the photos that were posted? Submitted by westward on Tue, 10/13/2009 - 23:53. Submitted by None on Tue, 10/13/2009 - 12:22. Its six separate parcels, many of those previously owned by All Crane since 1995. According to the PD and Crain’s all the parcels were bought by Chinese investors. The title changed hands, some parcels previously owned by Sta Realty aka Surety Title and some owned by ALL Erections and Crane Rentals. As of October 7th 2009 all the properties are now owned by 1600 East 55th Street L.L.C. The LLC is filed with the State of OHIO, it is filed as a Domestic Limited Liability Corporation. The LLC only discloses the agent aka front man, that LLC has existed since 2000 and was originally filed by All Erection and Crain rental. In 2009 an additional partner was filed on the LLC and the agent changed from All Cranes to Diamond Access. What is certain is that the property changed hands, the new owner is an LLC and Diamond Access is that LLC agent. If a Domestic Limited Liability requires the actual parties be in OHIO as in ‘Domestic’ then the Chinese have an OHIO partner or there are no Chinese Investors. Submitted by JRPoulter on Tue, 10/13/2009 - 21:39.
re "Richmond Building" stunning photo - love the line and colour contrasts! Submitted by noner on Wed, 10/14/2009 - 08:34.
about the yummy qualities of metal... my daughter does pretty things with metal, fabric, time and corrosives and gets really nice colours.